The resonance frequency (f0) and the impedance at resonance (Z0), are measured using a 2 VRMS sine signal. Our woofers are measured in a closed cabinet with outside dimensions according to the table you will find here. The cabinet is loosely filled with damping material. All loudspeakers are measured at 0.5 m/2.83 V on axis in our anechoic chamber using the TRF-module from Klippel GmbH. The microphone is a B&K 4133. Before measuring the T/S-parameters the driver has been run in at near maximum excursion in free air using a sine signal at f0 for 2 min. The resonance frequency and impedance at resonance are measured using a 2 VRMS sine signal. The moving mass and the BL-product are measured with the laser equipment from Klippel GmbH. Below, you will find some information which may make it easier to interpret the technical data. Power data is given with reference to IEC 60268-5. The signal is white noise, shaped to a defined spectrum, and amplitude limited so that the peak voltage is two times the RMS voltage. The maximum noise power which the drive units can take without permanent damage for sixty cycles consisting of one second ON and one minute OFF is the specified short term maximum power. The specified long term maximum power is defined as above but with ten cycles consisting of one minute ON and two minutes OFF. 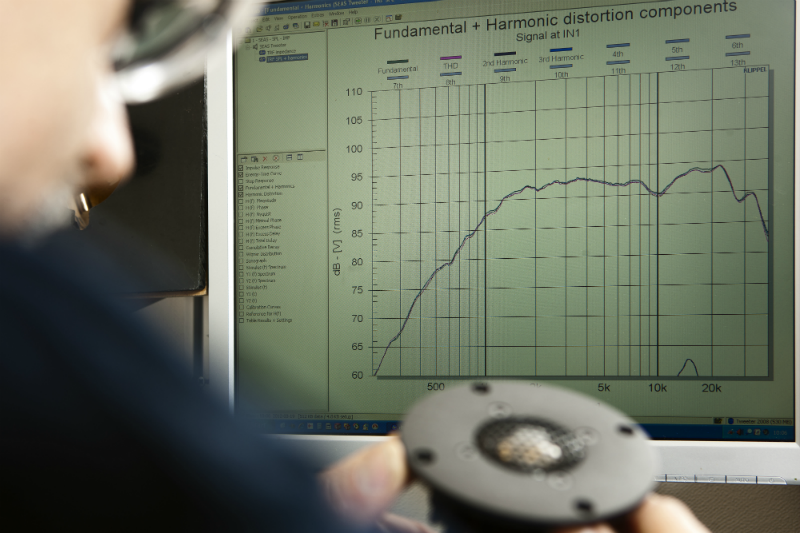 The mounting conditions in the above tests and during the sound pressure frequency response measurement are identical. Voice coil inductance is a controversial topic since the loudspeaker impedance towards higher frequencies can not be represented by a simple inductor. We have calculated the inductance value at the frequency where the impedance has risen 3 dB from its minimum above the resonance frequency. Resonance frequency fs is measured using 2 Vrms sine wave. Please be aware that differing power levels and measurement methods may give significantly different fs, and consequently different values for other parameters dependent upon fs. Linear coil travel is the total distance peak to peak which the coil can move with no significant change in the force factor. Maximum coil travel is the total distance peak to peak which the coil/cone can move without experiencing gross mechanical non-linearities and limitations.